Replete with food and fuel I leave on LE331 and head north-east to Embalse del Porma, a huge lake with a very impressive dam at one end. The well surfaced, empty road skirts the outside of the lake, passing through tunnels and over small viaducts where the sides become too steep to support a road unaided. A bit further on, signs for road works warn of another gravelly stretch to come, but instead I am treated to virgin tarmac so black that I wonder if it’s there at all. Even the ever present free-range cows are too embarrassed to tarnish the surface as they so regularly do, and instead fertilise the many lay-bys provided to let bikers take photos and presumably relieve themselves, if the many crumpled tissues are anything to go by. The road works never materialize, and instead I pop out at the top of another gigantic lake, the Embalse de Riano. Riano itself is a pretty little town that’s mushroomed into existence on one end of a bridge across the lake. I want to stop but the immaculate new church steeple and oh-so-new houses put me off almost as much as the many expensive cars in the car park, so I give it a miss. Riding along the side of the lake I see many animal and vehicle tracks across what must have been a couple of square miles of dry, dusty earth that had once been underwater. In the distance is a camper van – perhaps I too could get down there? Already planning how I’m going to set up the camera to record a movie of me driving into frame from the horizon followed by a cloud of dust, I turn off the road at a gap in the barrier and down a steep dirt track just wide enough for a car. Only when I’m nearly upon it do I notice the barbed wire fence that the farmer must have put up in order to keep whatever was making the tracks in the sand from making smears on the road. Unable to lock the back wheel and slide myself into an easy turn (thanks ABS!) I instead execute a maneuver involving the side of the track, much shunting, and the eventual smell of clutch. I don’t know how that camper van got in there, but I wasn’t about to start pulling down any fences just for a couple of photos, so I let the bike cool down before carrying on. The N621 leads north-east to Potes, taking me across the most spectacular twisty pass to date – Puerto de San Glorio. I must be nearing some kind of tourism center now as I see many English cars coming the other way. I count six Porsches (including a GT3 in full race trim) and two Aston Martins, all being driven enthusiastically and bringing back memories of fish-tailing lorries as they bear down on me through oncoming bends. 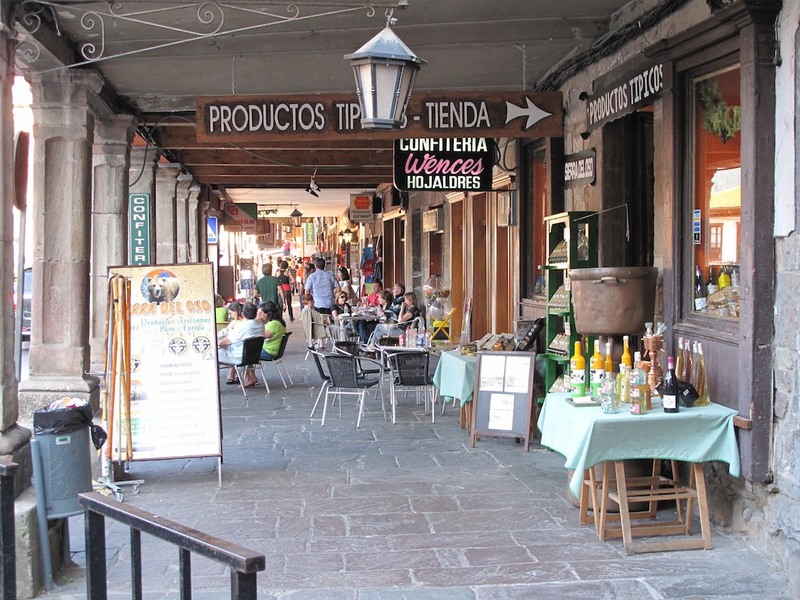 Although I want to stop near Potes for two nights, I press on to Amiezo where I’m hoping to end the week with a night at La Pisa, a rather special hotel run by John and Gwen which had been recommended to me be several people before I left the UK. I suppose it’s really a B&B, but to call it such puts me in mind of small, cold rooms and the kind of showers that you otherwise only get in caravans, so ‘hotel’ it is. I am not impressed with Potes as I drive through. Multi-storey hotels are advertised with neon signs which a blind person would find excessive, and identical shops sell identical tourist tat to identical tourists. Many of them are eating at roadside restaurants which sport a Union Jack above a picture of something battered and fried in the window, and I actually see one slightly tubby reveler taking a picture of his wife, who was posing beside a plastic donkey outside an ‘antique’ shop. Just think Malaga with mountains, you won’t be far off. Did I really want to spend two days here? Was it too late in the day to hoof it back down to Mirantes, or anywhere south for that matter? These were my thoughts as I rode the final dozen kilometers to Amiezo, a pretty rural village at the top of a gorge entirely devoid of neon signs and people in football shirts. Gwen and John couldn’t have been more welcoming. 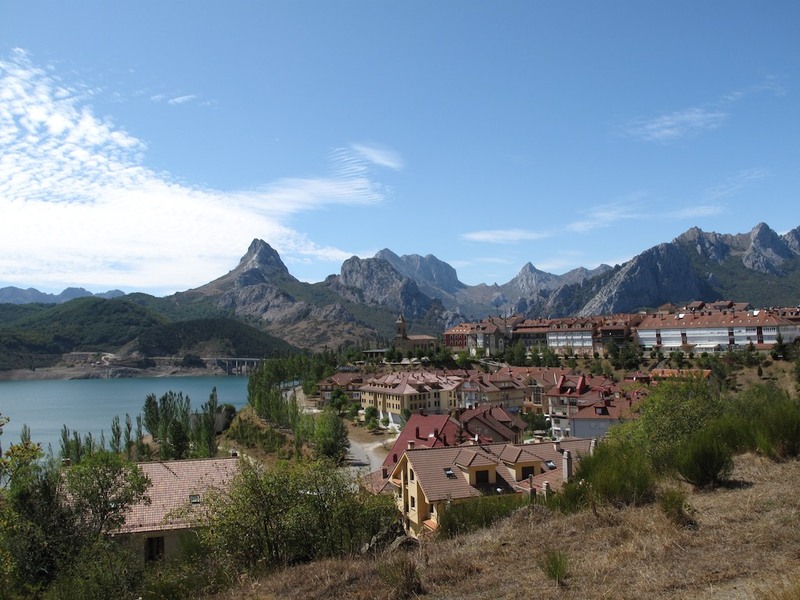 Complimenting me on my Spanish once they’d gamely allowed me to stammer a few verses, the conversation drifts to life in the Picos and where to find the best roads. An older couple – who were on the same boat from Plymouth as I – joins us at the bar, having just returned from a walk which has given them either altitude sickness or radiation poisoning. They’re not sure, but she admits that next time she’ll think twice about leaving England in September without sun tan lotion. He comments on my bike, and congratulates me for not being one of the born-again Harley crowd. (“Look the same, dress the same, ride the same. Idiots – they’re bloody dangerous” and so on) They don’t recommend the cable car ride on Fuente De, which costs 14 Euros and will probably end in a cloud as it had for them a couple of days ago. I’m relieved to hear it, for although I had suspected it would be a bit touristy I was going to go along for a look. I’m booked in for the 6th however, which at 55 Euros will be the most expensive accommodation to date. To be fair though that includes dinner and breakfast, and John’s skills in the kitchen are reputed to be considerable. In any case, the menu changes daily and today’s edition features rabbit, which I like very much. 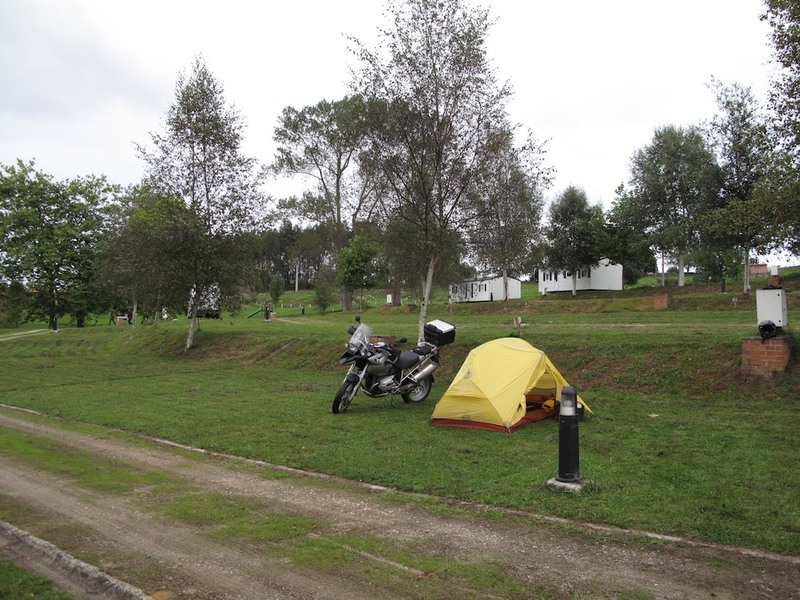 Before moving to the Picos, John and Gwen used to come out here on camping holidays, so I take the opportunity to ask them for the best site. 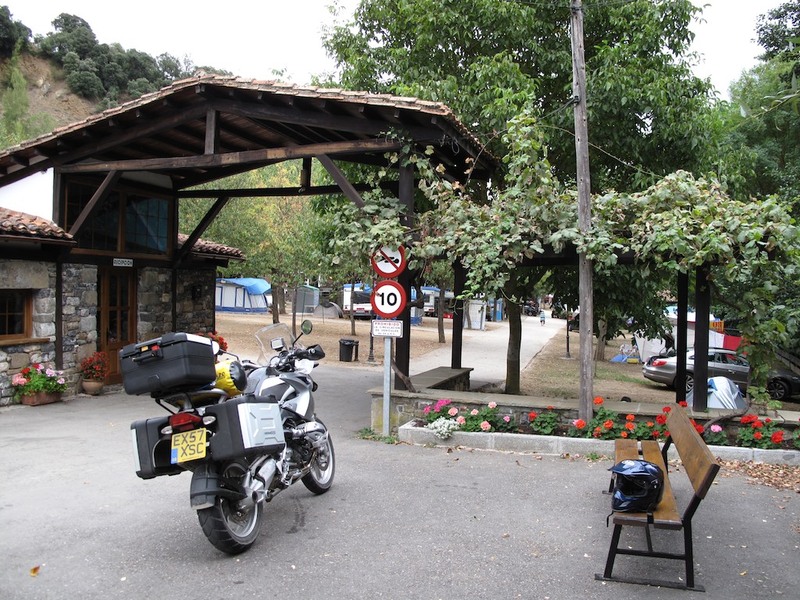 I was hoping to stay at Las Islas, just outside Potes on the road to Fuente De, but John recommends that I pass that one and ride for another kilometer or so, stopping at San Pelayo instead. It’ll be quiet, is further from the road, and they have not only a washing machine but also a drier. I finish my club sandwich and beer, eager to get set up soon, and head back through Potes on to Fuente De. Passing the Las Islas campsite I see that John and Gwen were right, it really was close to the road and also quite full, so I gladly continue to San Pelayo. Once there I can’t believe my eyes – every square inch is packed with caravans, tents, mobile homes, and screeching, yapping children in brightly coloured beach towels. It’s so full that one person has even had to set up their tent underneath the large wooden sign listing all the site’s charms, right outside reception. None of the people looked like they were what I would call proper campers anyway. For me, camping is a chance to get away from the comforts of home and enjoy much simpler pleasures, like cooking basic food on a stove or an open fire, sitting around with other campers by torch or candlelight, or surrounding yourself with nature and marveling at the way you’re managing to get by without all the tools and trappings which you take for granted in your normal life. The people at San Pelayo were the other kind. Everything from the kitchen sink to the Sega Wee Station™ has been crammed into a huge MPV, to which they’ve invariably added a trailer and roofrack just so that each of their six noisy offspring can bring along bicycles, tennis rackets, canoes, their favourite pet, a ping-pong table and the DVD collection, as well as a dozen assorted musical instruments with which to while away the small hours. Parents stroll about the place in white slacks; he with a cream coloured Pringle jumper draped perpetually about his shoulders yet never actually worn, she with a different Louis Vuitton handbag for each hour of the day. I’m still reeling with the full horror of it all when a red-coat comes sauntering toward me from reception to enquire if I’d like to come in and set up my tent, or perhaps rent one of their static caravans? He’s well built and tanned, his hair slicked back to curls at the back of his head like a Brazilian footballer. He too wears white slacks and a pristine white polo shirt carrying the campsite’s logo on his breast. I decline his offer, saying I’m lost, which is closer to the truth than he’ll ever realize. This is what you get for taking campsite advice from somebody who owns a Volvo with a National Trust sticker in the windscreen. There’s still daylight to be had and I’ve over half a tank of fuel, so I simply head north, straight out of the Picos. I’ll never find happiness at a campsite where an endless supply of tourists are guaranteed irrespective of service. Much better to search out a site that’s out of the way in some sleepy little village, miles away from any tourist attraction, where the owners actually have to work hard to earn repeat business through word of mouth and club recommendation. The road I’m on is one of those recommended to me by the couple at La Pisa, and they were indeed right in describing it as being in a gorge where the low overhang of rock causes lorries to take whichever lane is furthest from the wall. This is sometimes the right-hand lane, sometimes the left, depending on which side of the river the road is currently running. Overtaking becomes a nightmare, cars moving in clumps lead invariably by a tourist or somebody who has hired a car with a manual gearbox thinking it’s an automatic. Lorries too become difficult to overtake, for they lurch erratically into the left lane whenever the driver feels that the rock ceiling over the right hand lane may be too low for his vehicle. The gorge is so deep in places that it has developed its own weather, and the weather currently being served is drizzle with light fog. Add to that a heady mix of hairpin bends, single lane bridges and constant overtaking / no overtaking zones, and you’ve got exactly the kind of road that becomes a right pain in the backside when you’re trying to find a campsite that isn’t hell with a pool. The GPS comes up trumps, once I’m out of the gorge and have regained a signal. A site called Mirador de la Llavandes is just 5km away. Forgetting that this is again as the crow flies, it takes me half an hour to ride the actual 25km of twisty single lane inter-village roads, which are now rather slippery. I recognize one row of brightly coloured houses, and then the road itself as one I’ve taken at the start of this trip following my first night under canvas. I check the GPS again, and there are indeed half a dozen sites within an hour of here, even if you allow for optimistic crows. I arrive somewhere around 20:00 or 21:00, and following the usual lo-siento-much- no-hable-Espanol-una-tiende-de-camping-por-favor-muchas-gracias to the lady at the bar she reopens the reception building opposite and takes my details. There are a couple of people at the bar and I ask if the site is busy, anticipating the worst, but she replies that there is only one camper van and two tents. She catches my murmur of relief and replies that no, it is not good, and I apologise for having put my foot in it. It’s her livelihood and I’m glad there are no customers, how stupid! Having pitched my tent I adjourn to the bar / restaurant without the usual post-ride shower to see what’s on the menu, and am presented with the opportunity of making her some money. The food costs more than I expect, but is served fairly quickly and certainly tastes good. I start with chorizo sausage, which I was expecting to be a little like French saucisson. Instead I win a bowl of soupy-looking liquid – cider – in which floats a sausage in about half a dozen bite-sized pieces. Not the best cuts of meat (are sausages ever?) but it’s well cooked and beautifully spiced. For course number 1 I opt for guisantes salteados con jamon, which is oily fried peas with ham. I didn’t know what to expect for this, and wasn’t disappointed. Tasty, and unique. Course number 2 is nearly always meat of some kind, but the carne side of the menu started at 15 Euros for a basic steak, and I didn’t think that it would be all that great given the level of demand tonight, so I opted instead for the fish. I’d never heard of one called Dorada a la Plancha before, so rather than look it up in my Spanish phrase book I allowed myself to be surprised. It turned out to be a whole fish with quite a large head, cut open lengthways and slowly fried with garlic and onions. Delicious. 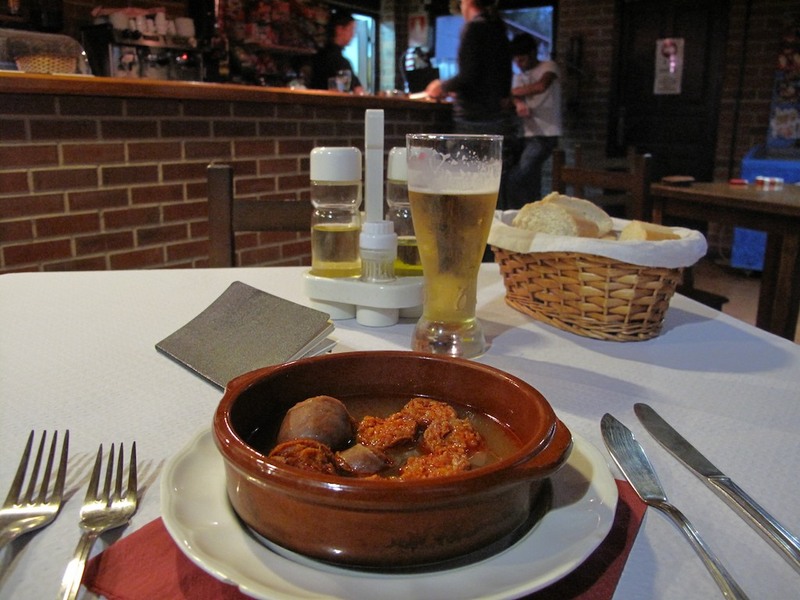 Dinner comes to 25 Euros including 2 large San Miguel. Full of fish, cider, chorizo, ham, peas and beer I return to my tent and brew tea. While getting undressed and into my sleeping bag I am treated to the opening lines of what later turns into a full concert, courtesy of the Cantabrian Beeping Frog. Now your CBF is a truly marvellous creature, with a far better ear for music than any other amphibian, which frankly couldn’t carry a tune in a bucket. Each member of the orchestra plays but a single note. The duration is always the same from frog to frog, but the pitch of the note unique to each specimen. I imagine it’s down to the animal’s size. Regardless, each musician knows the song being played, and his or her place in the rendition. Different beeps follow one another, coming from all over the campsite and always in the same order. This goes on for verse after verse, until once cheeky member of the group decides to emit a series of notes in quick succession, cutting short the next participant and plunging the whole ensemble into stunned silence. Song sheets are checked and adjusted during the impromptu interval, and the orchestra begins again from page one. Beats the hell out of counting sheep.